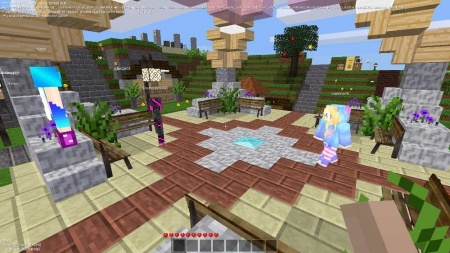 Minetest servers allow players to play online with other people. They can be run from a dedicated server, a Virtual Private Server or a home computer. This is not a list of servers, please see the Minetest Server List or Minetest Forum servers section instead. If you have obtained address and the port number of a server, you just have to enter those values into the respective fields in the “Client” tab in the main menu and click on “connect”, or press Enter. In case you used the in-game server list, Minetest automatically enters those values for you. You also need to choose a player name. Player names need to be unique on a per-sever basis. You can choose a password but this can be empty on some servers. The account registration in Minetest is never explicitly mentioned as such and happens in the background. In a player account all information about your player character, such as health, items, name, etc. are stored on the server. A player account is only valid for one server, so you can have different player names on different servers. IMPORTANT: An account is registered as soon as you connect to the server successfully for the first time. There will be no notification. Then you can pick a password for the player name on this server. This password can be empty, but some servers don't allow an empty password, so be prepared to think of one. Be aware that with an empty password, anyone could connect with this player name to the server. IMPORTANT: Remember and triple-check the password before you connect on a server for the first time. Minetest will not ask you to enter the password again. If you messed it up in the first time and don't realize it, you will logically fail in later logins because you probably won't remember how you mis-typed your password. Countless player names have been burned because of this. Warning: There is also no automatic mechanism to recover a lost password. If you lost your password, it's tough luck for you. You could try to contact one of the server operators, but there is no guarantee they'll help you. If you picked both name and password, hit “Connect”. To log in to the server again, just use the same credentials on this server as before. The gameplay in a multiplayer server is basically the same as in a singleplayer game. The same rules apply. See Getting Started for gameplay-related concepts. Well, at least in theory. Also, different servers are usually managed by different people, they also may or may not have rules which may or may not be enforced. 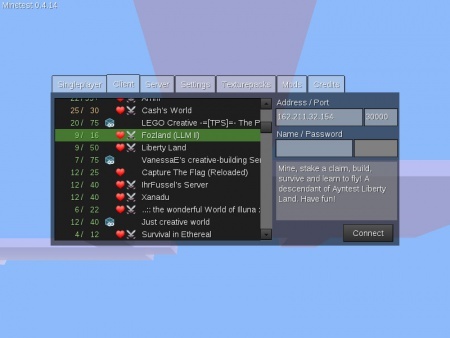 Find out more about the server with commands like “/mods”, “/privs”, “/status”. Also, you can generally connect to all servers, no matter how many mods they use or what game they host. No need for additional configuration or manual downloads. All data you need is downloaded automatically for you. “Griefing” and “protection” are two words you will read frequently when playing on servers. 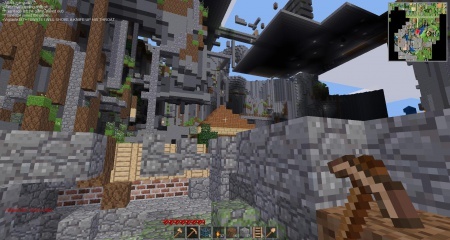 “Griefing” refers to the act of destroying, damaging, or vandalizing a building built by other players against their will. On some servers griefing is forbidden, on some servers it is allowed. Protection mods are very common on servers. 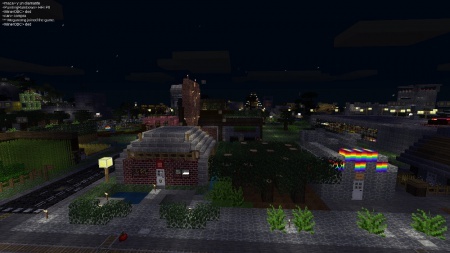 A protection mod is a mod which grants players ownership to certain parts of the world. Only the owner can add or remove blocks in an owned area. Protection basically eliminates griefing. See setting up a server for information running your own server. This page was last modified on 25 March 2018, at 19:00.